Winning the Monster Farm video game tournament was the high point of Genki Sakura's young life. Every day since then has been so boring in comparison. He's been waiting and waiting for his tournament prize, a game disc that he will be the first in the world to get to try out, but every day without it is agony. The real world is so boring in comparison to the world of monsters. Wouldn't it be better if he could just go live there? Finally his prize arrives, and it's everything he's ever dreamed of - literally, in this case, as somehow he ends up transported into the world of the video game! There, he meets Holly, a young girl who is trying to summon the Phoenix by using a disc stone (strangely similar to the CD Genki just got! ), and Suezo, a monster just like from the game. And of course, the swarm of monsters that had been chasing the two introduce themselves as well! Genki isn't worried, though. Even with the wicked tyrant Moo trying to conquer the world by turning all the monsters evil, Genki wouldn't want to be anywhere else. Besides, they're going to need an expert like him! 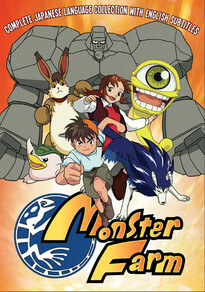 Note: Monster Farm is the original Japanese language version of Monster Rancher.